Enjoy a restaurant favourite at home. 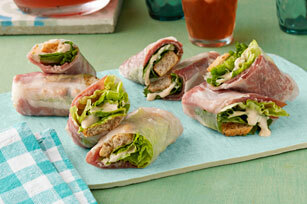 These salad rolls are filled with crispy lettuce, prosciutto, creamy Caesar dressing and crunchy croutons. Add rice paper, 1 sheet at a time, to large bowl of warm water; let stand 15 to 20 sec. or until softened. Drain on clean kitchen towel; transfer to work surface. Place 1 prosciutto slice on centre of each rice paper sheet; top with remaining ingredients. Carefully fold bottom of paper over filling, then fold in both sides and roll up tightly, starting at bottom edge. Add a couple of cooked cleaned shrimp to filling in each roll.